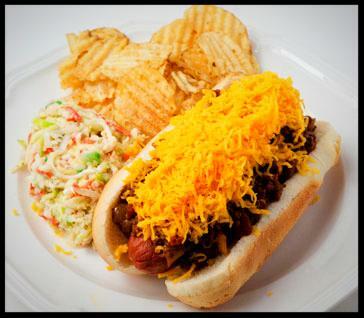 It's National Hot Dog Month, and what better way to celebrate than to delve into this all American food group. They're fast, kid friendly, have saved many harried parents with no time to cook, and they taste great. They also connect us with our childhood, our parents, and our hometown. They're a cultural leveler because you can find anyone in line at a hot dog stand, from wealthy captains of industry to powerful politicians to movie stars to laborers and the homeless. Here's an idea for your next big cookout: Many cities and regions have evolved a local recipe that is their signature breed. It has become part of their area culture and they cannot stand to eat them any other way. There's The Coney Island Hot Dog and its brother the New York Pushcart Dog, The Chicago Hot Dog, The Detroit Coney and its sibling The Flint Coney, The Cincinnati Cheese Coney, The Rochester Garbage Plate,The West Virginia Slawdog, The Seattle Cream Cheese Dog, The North Jersey Italian Dog, The Texas Wiener, The Rhode Island New York System Hot Wiener, The Sonora Dog, and The Weenie Royale. Click here to take a hot dog road trip and learn how they all are made. Known for their special sauce, Gus' Hot Dogs in Birmingham, Alabama kicks off our list. Next time you're in the area, try the "Greek Dog," a deliciously charred hot dog topped with flavorful ground beef, sauerkraut and Gus' special sauce!